I found a Rainbow Brite Dinner Set today. The lady who was selling it said she was lucky to have bought a whole stock of old things from a shop that was closing down. And the Dinner Set was in there. so I'd like to ask you guys if that's true. The box is in a really bad condition though. "Tell me that everything will be alright in the end." I have no idea how much its worth but its AWESOME! I'd buy it for sure. AWESOME! I loved kitchen stuff when I was little! I'd buy that straight away! I'd pay $50 for that, are you looking to sell? 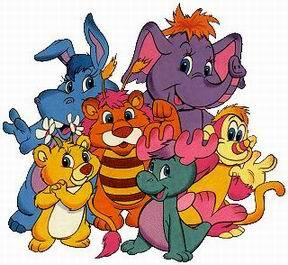 Rainbow bright was a bit before my time but i think the characters are cute from what i know..wow thats a nice set! I'd pay 20 and if I was rich 50!